The purpose of this page is to give a overview of the functions in the RRC-1258 system. For setup of your unit you should use the information in the Users manual which always have the latest information. This page will only be updated if major changes are done. After each setup pages is done press “submit” to temporary store the new settings. When you do that a new red “Apply changes” button appears on the pages. You can now change other parameters on other pages but the new settings will not take effect until you press “Apply changes”. When you do that the unit will reboot and start up with the new settings. If you change your mind after clicking on submit you can click on “Restart device” on the left, then the RRC will restart without changing any settings. Unit ID (Banner) Unit ID (Banner) Here you can put whatever text you want. DHCP Select No for fixed IP or Yes for DHCP. DHCP can be practical in Control end but Fixed IP is preferred in Radio end. Eth Type Type of ethernet connection. (1) 10 Mbit network is not sending out as much noise as 100 Mbit networks so it is preferable. It’s also default. (2) The switch you connect to must also be set manually to the same value otherwise it will not work properly, avoid this settings. Web page user If you want to password protect your units you can put the username here. If you leave this field empty the RRC will not ask for password. The status pages will always be possible to see even when the unit is password protected. Web page pwd In this field you put the password. 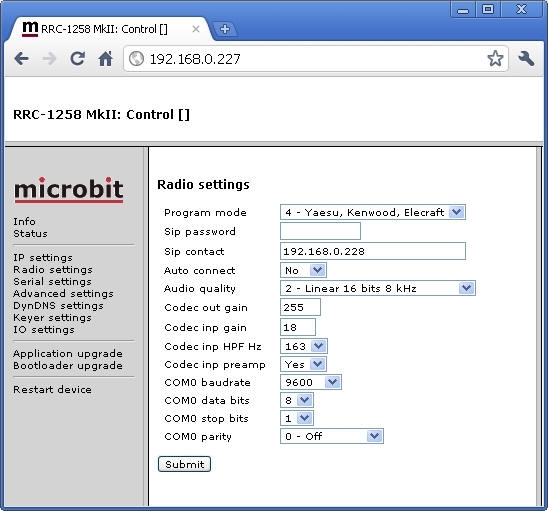 The Radio settings menu is used to setup the RRC to act together with different radios. The settings must be done in both Control an Radio end. Down below the settings are described more in details. Save the new settings by pressing ‘Submit’. 1 – ICOM CI-V for ICOM, when CI-V protocol is used. 3 – FT-8×7,FT-1000x for FT-817, FT-857, FT-897, FT-1000 etc. 4 = Yaesu, Kenwood, Elecraft for Kenwood CAT, Yaesu FT-2000, Elecraft etc. 7 = ICOM IC-R2500 for IC-R2500, IC-2725 with detached control panel. 8 = TS2000 for TS-2000 with RC-2000 control panel. Audio Quality Sets the audio quality depending on available bandwidth ( default = 2 Linear 16 bits 8 kHz) see detaild info on the codecs page. Codec Inp gain Should be 18 at control end for high level electret microphones. Should always be 0 at Radio RRC. For other radios = depending on Radio settings, HamradioDeLuxe settings etc. The serial settings dialog is used to control the behaviour of the extra serial ports which can be use for CAT control, rotator control etc. 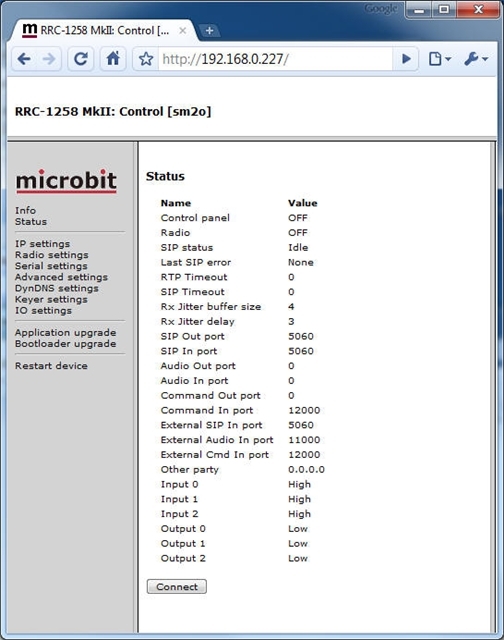 The RRC_1258MkII has two (COM1 and COM2) extra serial channels, RRC-1258 has one (COM1). COM 1 can always be used as a extra transparent serial channel. connection is done to the front D-sub marked COM 1. 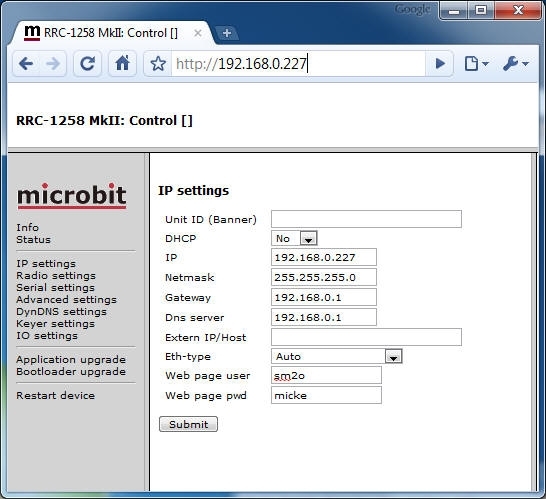 Be aware of if you use COM 1 as a transparent serial channel you can not use it for configuration. 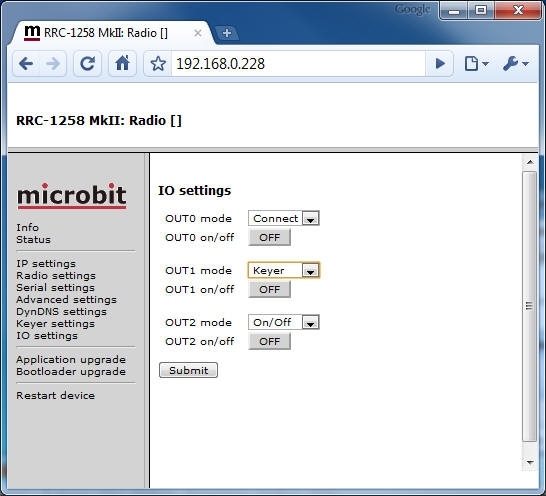 COM 2 which is available only on MkII can be used as an extra serial channel if the RRC:s are set to program mode 2,5,7,or 8 in other modes it’s already in use for the radio control. COM 1 can be used for optional purposes. COM 1 and COM 2 can be configured to have a little bit different behaviour depending on what they will be used to see below. 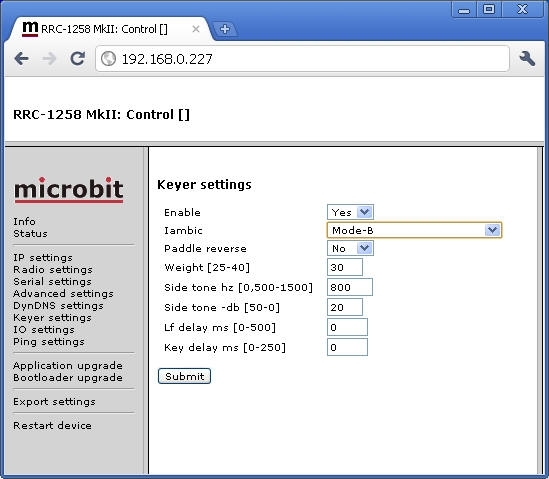 The settings must be done in both Control an Radio RRC:s. Down below the settings are described more in details. Save the new settings by pressing ‘Submit’. COM 1 mode Sets if the back serial port should be transferred transparent between the two RRC:s. and the behaviour of the transfer. IC-703/706 at the same time as you use Control panel. for Yaesu, Kenwood and Elecraft only. COM 1 parity Sets if parity bits should be used. COM1 terminator mode 5 Sets the terminator character used in Mode-5 to initiate the packet to be sent. It’s should be entered HEX-format. Attention ! 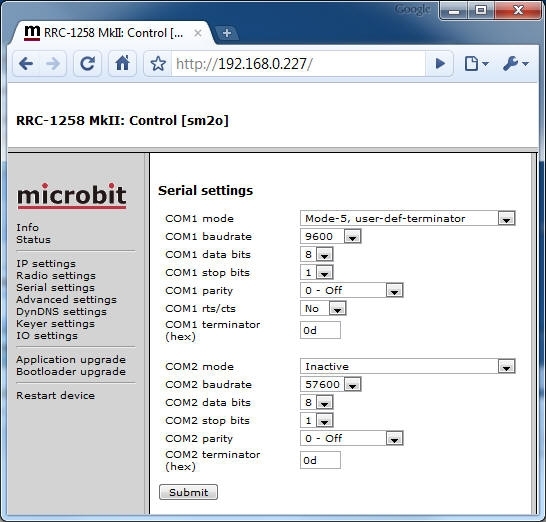 COM 2 is only available as an extra serial port in RRC-1258MkII. In RRC-1258 it’s always in parallel with COM 0. Sets if the back serial port should be transferred transparent between the two RRC:s. and the behaviour of the transfer. COM 2 parity Sets if parity bits should be used. COM2 terminator mode 5 Sets the terminator character used in mode 5 to initiate the packet to be sent. It’s should be in HEX-format. The latest software releases has user configurable port settings to make it possible to use several RRC:s on a LAN and also use the RRC if you have SIP based IP telephony using port 5060 in place. You need to know what you are doing when you change ports especially on the remote end so that you don’t disconnect yourself. If you do a factory reset from the menu, all settings go back to default. To change the advanced settings, click on the link ‘Advanced settings‘ to the left in the web browser when you have made the connection to the RRC. Here you can change the settings, and save them by pressing ‘Submit’. 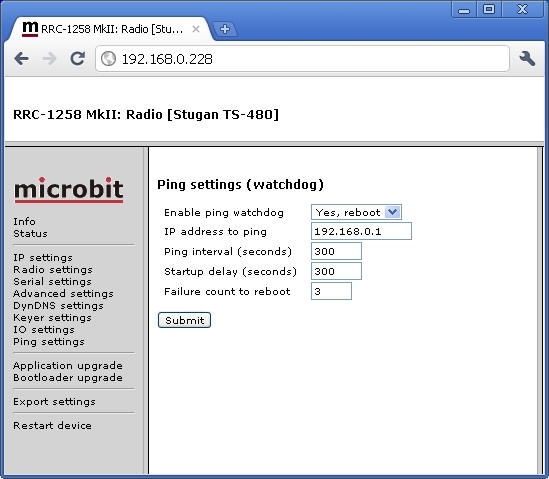 In the Radio RRC it can also be activated. Some mobile (3G) networks take some time before they open up for a continues audio stream which end up in problems when releasing the PTT. Continues RTP stream often solves this problem. Debug level Not used , should be = 0ff. 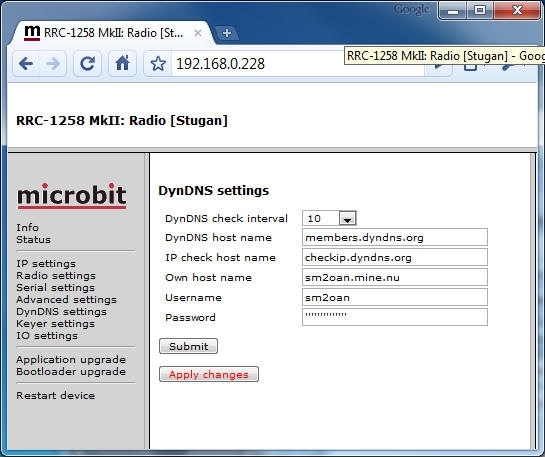 A built in DynDNS Client is implemented in the RRC-1258MkII. Dynamic DNS is only interesting in the radio end if you have a Internet Service Provider which use Dynamic IP. The DynDns client checks what IP address the router has got from the ISP and sends the updated information to DynDNS:s DNS server. When using DynDNS you can use your own “Host name” instead of a IP address in the SIP contact field and you don’t need to bother if the IP at the radio site changes. You need to register a account (free) at www.dyndns.com to start with. After that you enter the same information at the Internal DynDNS web page in the RRC. Remember that host names starting with a digit is not allowed. “DynDNS check time” sets how often the IP-check should be done. DynDNS says it should be 10 minutes or longer. If you select “0ff” the DynDNS client is not activated. There are other providers of the same service but RRC-1258 only supports DynDNS today. 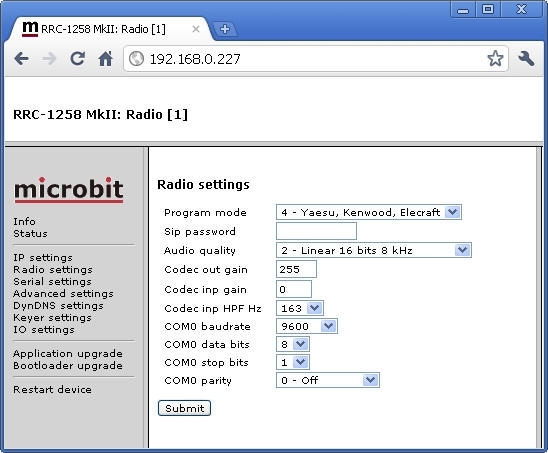 A very powerful function for remote CW operation is implemented in the RRC-1258MkII. The system is now able to handle delays and jitter caused by Internet in a unique way. The Keyer settings link will only appear in control RRC. iambic sets different keyer mode. If you set 0 Hz No local side tone is generated, can be used to test how the CW sounds if you enable side tone in the radio and send with memory keyer or PC. The Inputs and outputs in both the Control and Radio RRC is configurable to meet different needs. I/O = The input is transferred from Control to Radio RRC. OUT0 mode Output 0 can be configured for one of two functions. I/O = Indicatind that SIP connection is up. Keyer = The output act as a local output to for the keyer to key an local radio. OUT1 mode Output 1 can be configured for one of two functions. I/O = The output follows Input 1 from the Radio-RRC. OUT2 mode Output 2 can be configured for one of two functions. I/O = The output follows Input 2 from the Radio-RRC. USB DTR as CW ON/OFF The USB virtual comport DTR signal is used as ext keyer input. 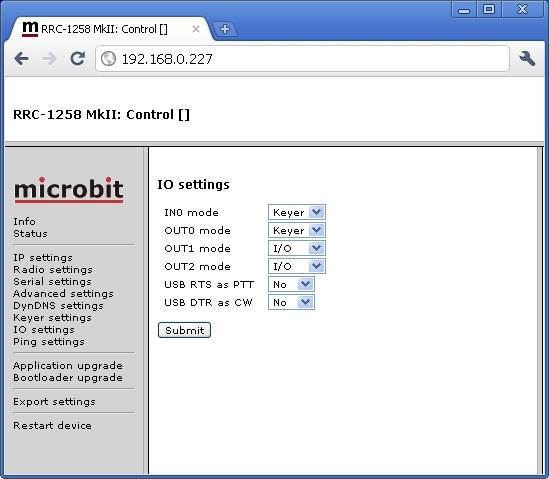 I/O = The input from the control RRC is transferred to the output of the Radio RRC. Keyer = The output is used for keyer output to the radio Straight key input. On/Off = The output will be controlled from the ON/OFF button* on the row below. * If the ON/OFF buttons are pushed the output change will be immediate. But will resume to last saved position after power on. If you want the changes to be permanent use the “apply changes” button. As an extra security function there is an ping watchdog function implemented which is quite common in network equipments. 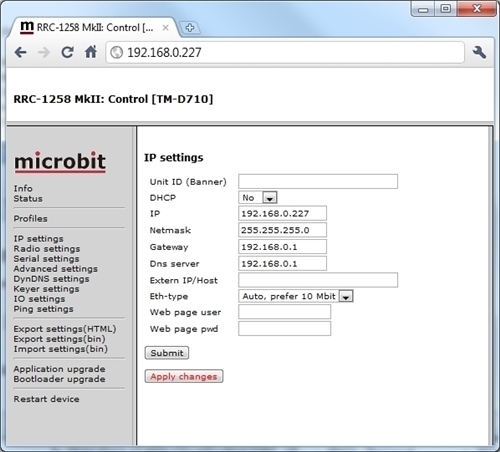 It can be set to ping a IP address and when it does not get any answer, it will make a hard reboot of the RRC. The status off the ping watchdog can be checked at the status page. This function is only available on the Radio-RRC. Enable ping watchdog Enables the function. Yes, reboot = Function is enabled. Failure count to reboot Sets how many times the ping are allowed to fail before reboot is done. The Software can be updated over the internet via the web interface when bugs are fixed and/or new functionality is implemented. 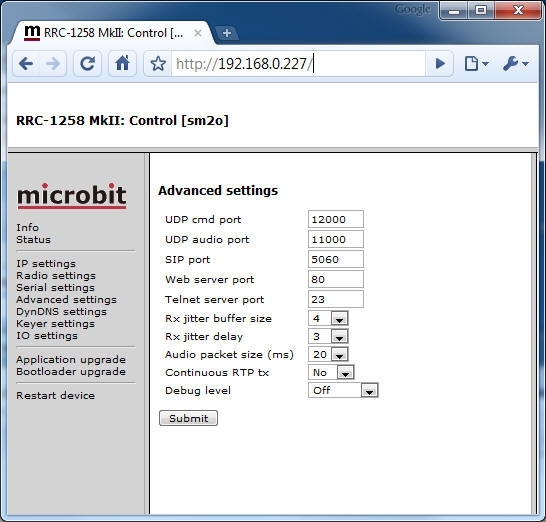 You don’t have to be where the RRC-1258MkII is to do the updates. 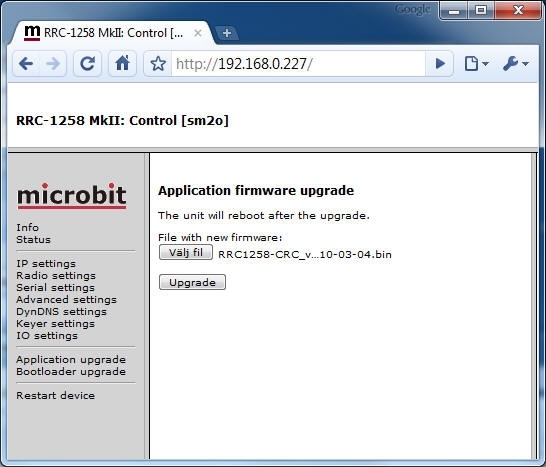 Start your web browser and connect to the RRC you want to update. Click on the link ‘Application upgrade’ to the left. Click on the ‘Browse’ button and select the file you downloaded a minute ago. When you have found it click on ‘Upgrade’. 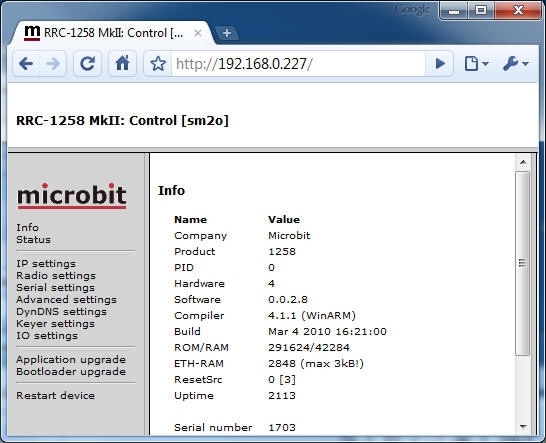 The new firmware is transferred to the RRC and is written into the flash memory of the RRC. The RRC will now restart, Note: Do not interrupt the upgrade process in any way. Wait a minute or two then connect to the RRC again and click on the “Info” link to the left and check that the Software version is updated. If it looks like it’s not updated empty the web browser cache, to prevent it from showing an old cached page. The update NEVER fails but the browser is a common problem. On the status page you can check some parameters which can be useful when debugging etc. But the most important is that here is the “Connect” and “Disconnect” button used to connect or disconnect the Internet connection between the two units. When connecting you will see how the SIP-status is changed to “Connected/Transferring” if everything is OK. Here is also shown how your NAT-router has mapped the ports true the NAT-router. Can be used if you want to restart the unit without doing any changes (before apply changes). Or just for ordinary reset.